In a far-off kingdom, a chess queen takes a daily walk across a spiral path, numbered from 1 to n, not caring to follow the spiral itself, but simply making queen's moves as she would on a chessboard. The queen is beloved by her subjects, and they make a note of every square she visits on her path. Given that the queen can start her walk on any square and ends it on any square, what is the shortest queen's walk that she can take? Given a spiral of integers on a rectangular grid, write a function that returns one of the shortest possible paths (counted by number of cells travelled) between two numbers on this spiral grid using a chess queen's moves. Some possible paths include 16, 4, 2, 10, 25 and 16, 5, 1, 9, 25. The input will be any two positive integers. The output will be a path of integers (including both endpoints) across the spiral using only orthogonal and diagonal moves. The length of a path is counted by the number of cells travelled. Your answer may be a program or a function. 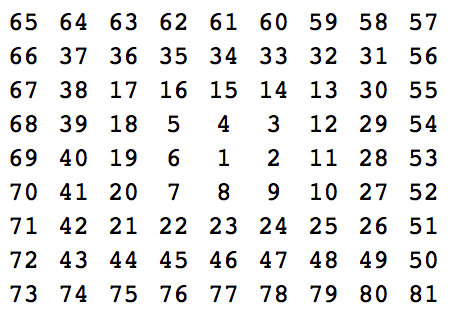 This is code golf, so the smallest number of bytes wins. As always, if the problem is unclear, please let me know. Good luck and good golfing! This constructs a number grid, converts it into a graph, and then finds a shortest path between the two numbers that were input. numberSpiral is from Mathworld Prime Spiral. It creates an n by n Ulam Spiral (without highlighting the primes). findPath converts the number grid into a graph. Edges are valid queen moves on the number grid. The shortest path from 80 to 1 contains 5, not 6, vertices. Builds the spiral in a square 2D array using four mutually recursive functions. Another recursive search to build the path list. This is a port of my Python answer. Golfing suggestions welcome. Edit: 45 bytes thanks to Jordan and their suggestions of d=*n=m*m;*e=c=0;*t=a, .rect, 0<=>x and x,y=(e[a]-g=e[b]).rect; t<<d[(g.real+x)*m+g.imag+y]. Another byte from (x+y*1i) to (x+y.i). This answer looks at the coordinates of a and b on the spiral (using complex numbers) and adds the diagonal moves first, then the orthogonal moves. Not the answer you're looking for? Browse other questions tagged code-golf path-finding chess or ask your own question.